I love a good puzzle game and I especially love any game that can pull me away from the blood, guts and misery I’m usually knee-deep in. Don’t get me wrong, I love blowing things to pieces and watching other things burn but a guy can’t live on violence and gore alone. That’s why I made it a point this week to feature a game that involved smiles, puzzles and enough color to brighten my dark gaming habits. 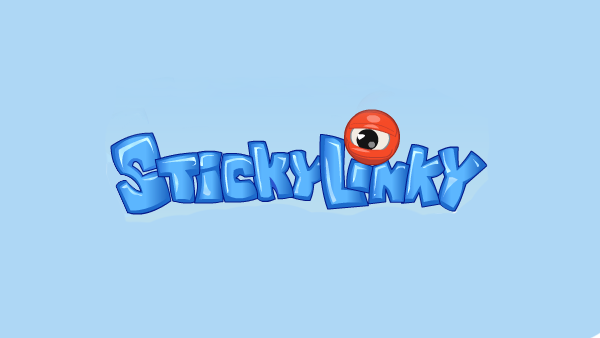 Sticky Linky is a physics based puzzler where you’re tasked with forming little creatures out of multi-colored blobs. The goal is to fill your meter (or vine) with a predetermined number of these little guys, while also trying to earn points through larger combinations of blobs, etc. You’re limited on how many times you can click on the blobs by your mana supply, which is represented by a little jar filled with that tried and true magic fuel. The joy of the game comes from watching the little squishy creatures roll around and form together in the ways in which you intended them to and a lot of the times, the ways you did not. There floating blobs will one day grow into bigger more beautiful blobs with faces. The levels start out simple enough, though later on the game introduces some twists on the mechanics, such as blob eating fish and night levels where you only have a limited number of creatures to form. One of my favorite little game changers was the level in which the blobs were attached to little bubbles, causing them to float up into the air as opposed to tumbling onto the piles below. I’d like to add that the music in the game really lifted my spirits and almost caused me to do a small but elegant jig of sorts. I did, however eventually mute it because one can only do some many jigs in a day. I don’t know a whole lot about Gluey Games, but I’d venture to say they are generally happy people who like colors, physics and the procreation of unusual life forms. That’s ok by me, I think I now like all of those things as well.